Most campgrounds offer an electric source to plug into, but how about making your own electricity? There’s a way to do that for free, on the road. 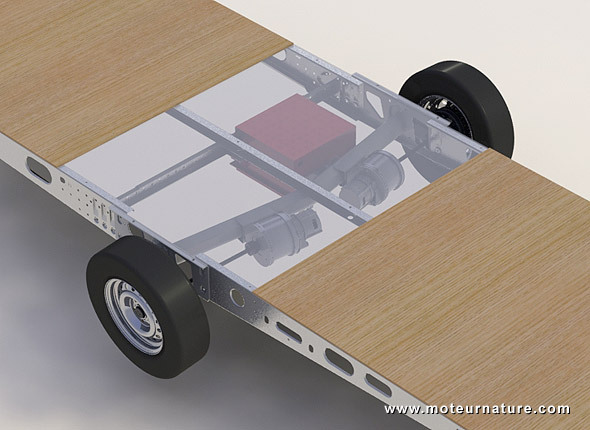 German travel trailer manufacturer Knaus Tabbert has designed a system to make electricity while you drive. It’s not new technology, it works exactly like the generator on a bike. There are 2 generators actually, one for each wheel. Like on a bike, you may fear that it will increase load, which would translate in more fuel consumption, but the system has been carefully calibrated for efficiency. It starts to generate electricity at 10-kph (6-mph), with the maximum output being at 35-kph (21-mph). So that when you’re at normal road speed, the extra load from those 2 generators is minimal. Fuel consumption is hardly increased. This system even stands comparison with solar panels, because it’s making 850 watts of power. You’d need a huge trailer, with the whole roof covered with photovoltaic cells to get that much. Those solar panels would also add a lot of weight on top, which isn’t good. Electricity is stored in strong AGM batteries (maintenance-free lead-acid), they should last up to 5 years. Total weight is 150-kg (330-lbs). Designed by Knaus Tabbert with the help of Al-Ko (the chassis maker), this system is not yet available. 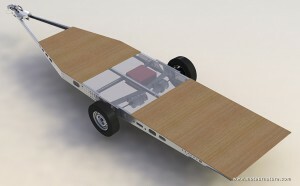 It will be unveiled at the caravan and motor home show in Dusseldorf, at the end of this month. It could be on the market soon if there’s sufficient buyer’s interest.